This pin is exclusive to Pink Wings website. Our "Give Cancer the Boot" Pink Ribbon Pin. The pin is 1 1/4" tall and is great quality Cloisonne. 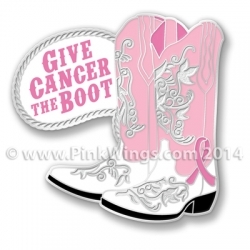 Order your pin today and tell the world that you want to "Give Cancer the Boot!"